Rising Voices note: This article appeared originally in Este País and it has been translated and republished with the permission of the author. Fortunately, more and more indigenous communities are taking ownership of the media. In a country [Mexico] where media concessions are state property, I believe that it is essential that indigenous peoples and communities develop their own media without being penalized. Considering the history of the formation of the Mexican state, one would hope that at the very least, indigenous peoples could utilize media such as radio and television without having to be labeled as illegal and criminal, or being persecuted as had taken place throughout their history. 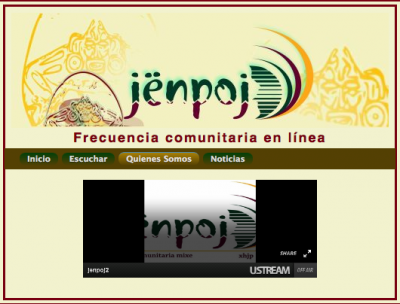 Despite this, the number of community radio stations continue to grow and there are examples of television broadcasts in indigenous territories, as well as more and more audiovisual production. This exercise taking place in the communities is closely linked with the strengthening of languages and with cultural reflection and of their own political and identity process facing the state. On the other hand, the appropriation of written communication passes through a more complicated process of creating an audience. It is true that written communication in national languages other than Spanish has existed and continue to appear, but undoubtedly it cannot be compared to the enthusiasm and the frequency in which community radio and other media that do not depend entirely on writing appears. In this article [pdf], the Juchiteca poet Irma Pineda tells us about Neza Magazine (the correct path) that was published in Mexico City by the New Society of Juchiteco Students. The Iguanazul Magazine, founded by Judith Santopietro, promotes literature, art, and the oral tradition from indigenous peoples in Mexico. In addition to the periodical, Iguanazul is also a cartonera publisher and nomad radio focused on media production in Náhuatl. In addition to those I mention here, there are other short-term periodicals that arise more often, and surely there will be many more that I do not know and will appear as initiatives within indigenous communities. However, almost all share the fact that they are bilingual publications, while the majority of periodicals in Spanish are monolingual. Publications in indigenous languages seem to still need Spanish by including mirror pages. This situation seems to me that the evidence of the ownership of the written press as a communication media involves an impressive effort: creating readers in indigenous languages. Despite the daunting task, I believe that it is essential to begin with the work and to also attempt to take ownership of this media within indigenous communities. As we demanded and took ownership of radio, television, and other audiovisual media, we must demand and take ownership of the printing press, establish publishing houses by starting with the publication of periodicals, while creating readership. Within the movement of indigenous communication, written media should not stay behind, but should be claimed as one of the demands and as one of the main axes of action. Fortunately, a way forward is being built from the internet: there are more and more websites that use written indigenous languages to communicate and to are used as a tool, but that will be left for another article.